1. This pump could work well in full sunshine, when there is no enough sunshine, it may stop working. 2.Please make test run to empty the inner air before using the water pump and putting it into water. 3. Please don't put this into the dirty water and keep it regular cleaned, to avoid stoppage. LEDGLE- One World, One Light. 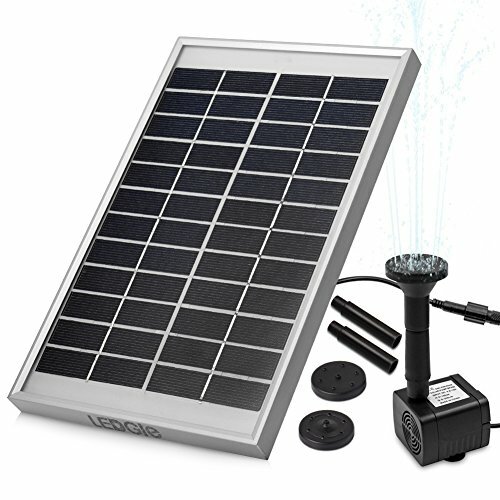 This is an eco-friendly solar fountain pump with modern design, what's more, is very easy to install and operate, also totally hassle-free. It's flexible so that you can place it anywhere as you like, no screws and plugs required. The water flow is 380L/h with the maximum height of 47in (120cm), and is equipped with multiple fountain nozzles, therefore, you can enjoy a wonderful mini waterfall landscape. Wow, what are you waiting for? Have one and enjoy the beautiful life! -Solar direct drive water pump with no need of extra battery, and the height of water totally depends on the intensity of sunshine. -Don't idle for a long time, which will shorten the pump's lifespan. -Don't soak the solar panel and controller under water. -Please clean the pump regularly for normal and highly efficient working. -Please keep away from Children for safety, with sharp edge on the solar panel. If you have any questions about this product by Ledgle, contact us by completing and submitting the form below. If you are looking for a specif part number, please include it with your message.